UN/MASKED follows the surprising 25-year journey of a young, New York City actress swept off her feet by a rising movie star who carries her to Malibu and back for a three-plus year love affair that is both fantastical and physically dangerous. When Nicole Brown Simpson is murdered in Brentwood she hears a bell go off, awakening her angry, activist spirit. 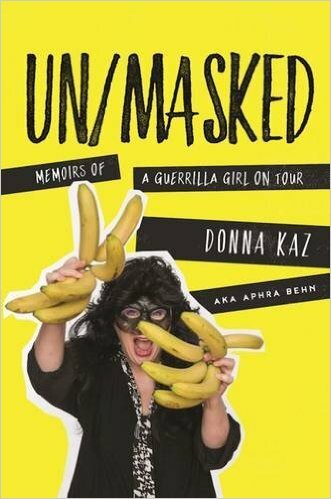 Always an outsider, she takes one step further into invisibility and becomes a Guerrilla Girl, a feminist activist who never appears in public without wearing a rubber gorilla mask and who uses the name of a dead woman artist instead of her own. As a Guerrilla Girl, Aphra Behn creates comedic art and theater that blasts the blatant sexism of the theater world while proving feminists are funny at the same time. These two narratives – that of a young victim of domestic violence at the hands of a successful film actor and that of an artist so fed up with sexism in the theater world that she puts on a gorilla mask and takes the name of a dead woman artist to provoke change – have been lived by one woman. Donna Kaz offers her compelling firsthand account – illuminated by more than 30 behind-the-scenes photographs, stickers and posters – of her transition from a silent observer to an unapologetic activist. Moderated by Anna Jahncke, Education Intern.